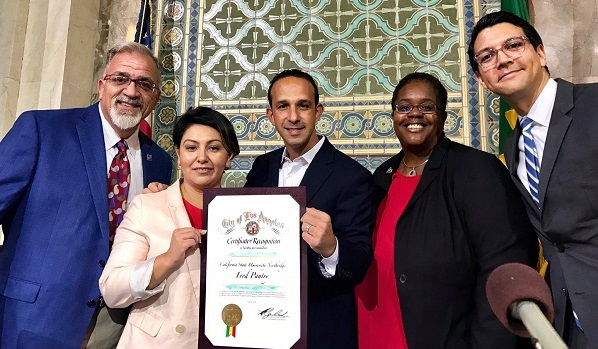 On Wednesday of this week in City Council, we honored Good Food champions from each district around Los Angeles. Today, when food insecurity is a major challenge for many in our City, there are many examples of services -- including those based in businesses, non-profit, academic, and religious organizations -- that are helping residents in need get healthy nutritious meals. From Council District 12, I chose to honor the CSUN Food Pantry which provides an essential service to students in our district. It is a tragedy when a student is unable to pursue an education because of financial hardship or an inability to pay for food. The CSUN Food Pantry is there so students who might not be able to afford regular meals can access nutritious, healthy foods that set them up for success. At a time when many students find themselves on the verge of homelessness, students should not have to choose between investing in their future and a meal. Thank you to the CSUN Food Pantry for everything you do to support students in Council District 12 and help ensure the success of our future leaders.